After you escape, you will arrive at another platform where you will encounter Zeus.Zeus is unhappy with you and basically tells you that he is going to kill you. The Blade of Olympus is taken from you and your power is drained. Kratos tries to get up and move, but will only be able to take slow, sluggish steps. Zeus stabs you, and as you are dying, you are sent to Hades. Upon your arrival in Hades, the goddess Gaia speaks to you. She tells you that she will not allow Zeus to kill Kratos, and decides to help him live.In return, Kratos needs to help the Goddess Gaia by locating the Sisters of Fate. Kratos fatal wounds are then healed. 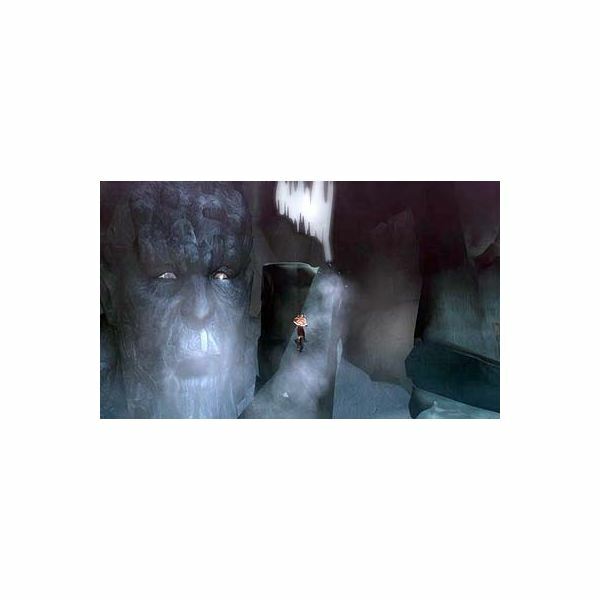 Now he must climb his way out of Hades. To get out, you must move Kratos up several walls and crevices to escape. Hands will reach for you from within the walls to try and attack you. Use the Blades of Chaos (your default weapon) to slash at them out of the way. Move to the right, jump past a small crevice and continue moving up. Once you reach the top you will see several of your dead soldiers. One is still alive, so click on each one until you speak to him. After a brief conversation, you will notice that there is a save spot nearby and Pegasus, the flying horse. Save your game, then go over to Pegasus and press the R1 button to mount him. By this time in the God of War 2 walkthrough you will see Kratos airborne! You can control Pegasus with your analog stick and the L1/R1 buttons. Griffins and Ravens will attack you in flight, and you will need to kill them off. Use your light and heavy attacks when they get close to you. The Ravens are not that tough and are fairly easy to kill. Griffins can take a lot of damage and have riders who will also try to kill you. Use the X button to cause Pegasus to do a rush attack that can ram into the Griffin. Animated control button sequences (usually involving the “O" button) will also appear during your final attacking blows. 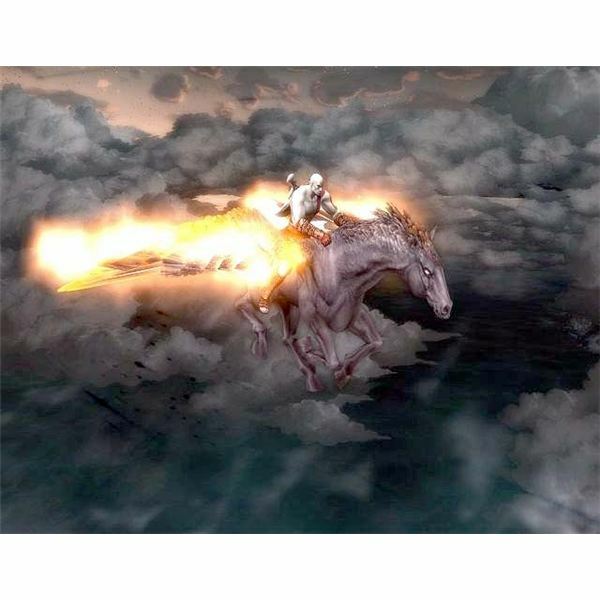 You will also need to look out for some projectile attacks that can knock Kratos off of Pegasus. After defeating a group of these Ravens and Griffins you will arrive at a cave tunnel. After flying through the cavern a bit, you will end up crashing to the ground. Unfortunately, Pegasus has become trapped by a stone Titan who has him underneath his large hand! At this point you will need to find a way to free him before you can continue on your journey to find the Sisters of Fate. Explore the nearby area carefully. Just south of you is a small ledge. Climb down it to find a Gorgon’s Eye and Red Orb chest. Go back up and head for the Titan’s large fingers. They are blocking your path into another area. Attack the middle finger to cause the Titan’s hand to move back a bit. Once you get by, head to the ledge where you will see a wall that you can climb. Start climbing down, attacking and killing the enemies that try and block your path. You will then work your way to a pathway. Get off the wall to see a saving point. Save your game. Moving forward in this God of War 2 walkthrough you will encounter a lot of bats that will try and swoop down on you. Follow the path and you will encounter some more green and red orb chests. You will arrive at an area with a large crate that blocks a horizontal rope short cut. Chop down the chest and you will be able to jump onto the rope to slide across to the other side. Fight your way through some more enemies to find additional chests. This pathway will lead you to a snowy area outside. When you walk outside you will immediately be attacked by a couple of Minotaurs and fighters. Take out the fighters first, since they are on a platform above and will keep sending projectiles at you. The Minotaurs are a bit tougher and can take a bit of damage. Depending on how you attack them, the game may or may not lead you to some brief animated combat button sequences. After you kill them all, look to the left for a cliff you can jump up to. Take the rope path down to where you will see a giant bird that is tearing at a man’s entrails.When you arrive the bird stops and takes off. The man turns out to be Prometheus, who has been cursed by Zeus and must endure this torture daily. Prometheus asks you to help him get released from this curse. Chop at the chains that are holding him down. This will drop Prometheus to an area below.Have Kratos slide down the nearby chain. Prometheus is now hanging over a blazing fire pit. Prometheus tells you the fire is the only way to release him from the curse. Unfortunately, you cannot reach Prometheus so you will need to find a way to knock him into the fire. Look around for a cliff wall that will allow you to climb down. As you climb down, you will encounter some more enemies who are hanging on the walls. Fight your way through, now going across the wall until you get to another cliff where you can go back up again. In the middle of all of this are a saving point and a red orb chest. When you reach the area where you can climb up, look nearby for a Gorgon’s Eye chest. When you reach the top of the cliff, you will reach a pathway that will go inside. If you have gotten this far in God of War 2, you will encounter three Medusas. They can turn you into stone with a green beam. Carefully evade their attacks. If you get caught in the beam you will turn to stone. If this happens, immediately move your analog stick left and right to free you from this trap. Killing them usually involves an animated combat button sequence during your final attacks (usually requiring the “O" button and using the analog stick to twist off their head). After you kill them, look for a shiny rock pillar. Chop at this to open up another pathway. Nearby are another saving point and some chests. Continuing with this section of the God of War 2 guide, you will now encounter the Typhon, the Titan that has Pegasus trapped. He will blow an icy wind at you, and if you are not careful, it can knock you off of the cliff where you are standing. Carefully move to your left, timing your maneuvering when Typhon is about to finish blowing air at you. There will also be bats trying to attack you at the same time.Notice that there are a couple of rock formations along the narrow pathway. Stop at each one to prevent Typhon from knocking you off the cliff, blocking the bat’s attacks. At the end of this pathway you have a little break from the wind and you can kill off the rest of the bats. Time the last section ahead and move to another large platform area. Typhon is upset and starts yelling at you to leave. Notice that there is a large shiny pillar nearby that you can knock down. Once you do, it creates a small pathway that leads directly to Typhon’s head. Carefully walk over, and then attack the Typhon’s eye using R1. The animation sequence takes care of the rest. As a result, you now have obtained Typhon’s Bane, a powerful and magical bow. Use the bow to target Typhon’s other eye to blind him. Move back to the large platform area. You are now trapped in it as it is blocked by a magical barrier. Some enemies will try to attack you on the ground, while other archers on cliffs will do the same from a distance. Use Typhon’s Bane to quickly take out the archers and eliminate the rest of the enemies. Once you wipe them out, the magic barrier will be removed and you can move forward. If you have followed this God of War 2 guide up to this point you will now need to go back to where Prometheus is trapped. Maneuver your way through some areas that you will need to jump through (and climb across ropes) eliminating the archers that try to stop your progress. After you get past this you will find another saving point and some red and green orb chests. Work your way past the walls you originally climbed to get into this area to get back to Prometheus. Now that you have Typhon’s Bane, you will be able to shoot Prometheus into the fire. This releases Prometheus power to you which now gives you a rage ability (activated with the L3/R3 buttons pushed simultaneously). Now that you have saved Prometheus, move back to where you originally moved into this area. Climb back up the chain to the higher platform. Look in the distance for a crate you can now shoot down with Typhon’s Bane. This opens up an area to get back into Typhon’s Cavern. Once shot down, go back down the chain and move into the area where the crate was knocked down. Climb up and you will see that you are in the area where you originally encountered the Minotaurs. Now, the doorway is blocked by a stone barrier with a red seal marking. Use your rage ability and chop through to get inside the cavern. Inside you will encounter more enemies that you will need to eliminate. Beyond them is a saving point. Not too far away is where Pegasus is trapped. To free him, use your rage ability and hack at all of Typhon’s fingers so they will lift off of the ground. All of his fingers must be moved in order for Pegasus to get loose. Once done correctly, an animation will appear and Pegasus will be freed. Climb back up to where he is at and press the R1 button to mount him. You have now succeeded in completing this part of the God of War 2 guide. You can now fly out of this area and continue your journey to find the Sisters of Fate. Strategy and tips based on Sheila Robinson's game play. 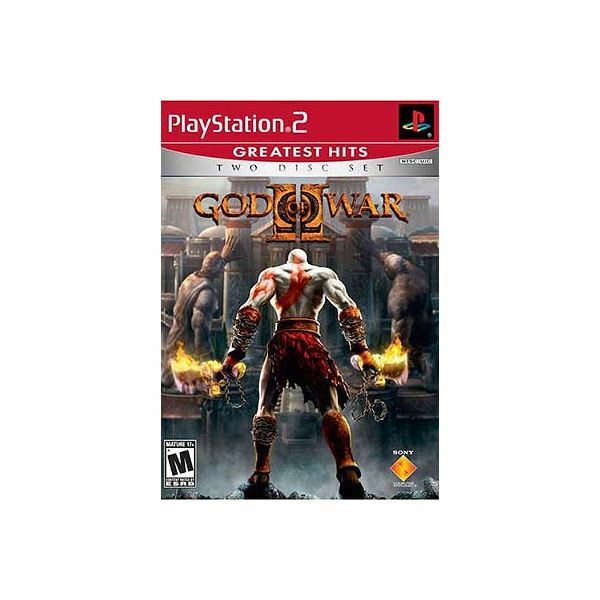 This is a God of War 2 walkthrough that details key sections of the game. Will you succeed in helping Kratos find the Sisters of Fate and fix the tragedies of his past? Filled with spoilers, it is a helpful guide that can assist you with this quest.